The never-much-good branch of Nationwide in Blackheath village is closing. More on 853blog here. Great poster from the Sydenham Library blog. Come and read extracts from your favourite book in Blackheath Library on 5th Feb, from 2-4pm, as part of the library protests against the cuts. We are holding the read-in in conjunction with other libraries across the country. We feel it’s wrong to close essential front line services like this which benefit the whole community. If you feel the same way please let people know. We hope to see you there. 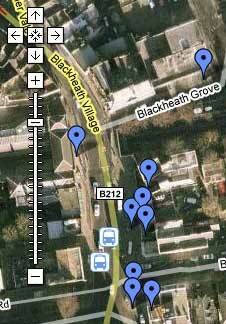 More info on the Blackheath Village Library Users Group site. Phillip Pullman on public libraries. Please read it Mayor Bullock, before you destroy our library beginning with B. It is the same guy. Quite a detailed report of what they intend to do. Would love to know how they plan to restrict sound from moving through the air. Thanks to Lewisham Council for responding so quickly to my request! Minutes of the meeting (Google Docs). NIMBY Events – connected with school chairs? “Don’t Lean Back”, a company that sells school chairs that (you’ve guessed it) don’t lean back, is registered to the same address as Nimby events. Interestingly, the founder of the chair company was also a school teacher. Guess where? In Blackheath. UPDATE: Photo of Tom Wates and the chair here. Here’s the leaflet from the Blackheath Society about the proposed pop festival on the heath. I didn’t get one – maybe they were only distributed along the edges of the heath? Text shown below – not because I necessarily agree with the sentiment! Are you aware that Lewisham Council has granted a licence for a company called NIMBY Events to put on a major Pop Festival on the Heath? It will be in the same location as the 2009 Climate Camp, but will occupy much more of the Heath. It has been fixed for 10/11th September 2011. 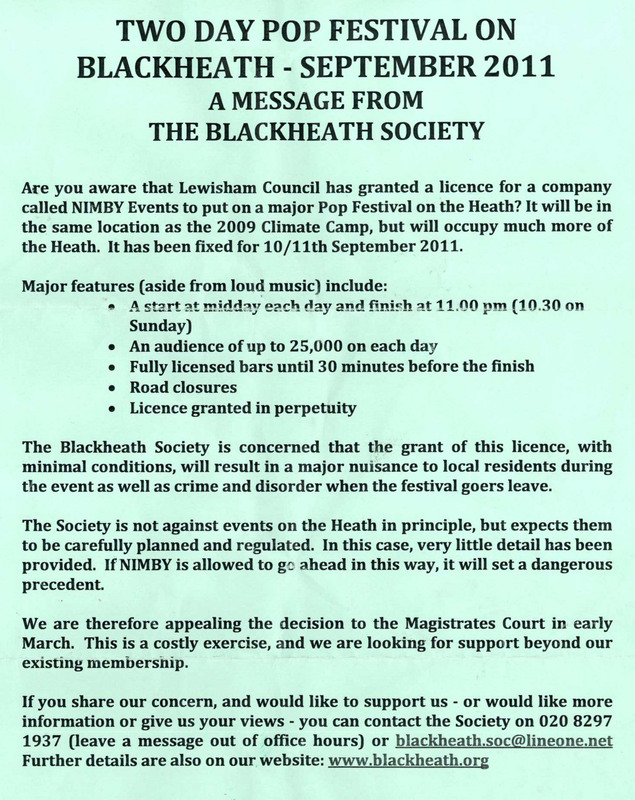 The Blackheath Society is concerned that the grant of this licence, with minimal conditions, will result in a major nuisance to local residents during the event as well as crime and disorder when the festival goers leave. The Society is not against events on the Heath in principle, but expects them to be carefully planned and regulated. In this case, very little detail has been provided. If NIMBY is allowed to go ahead in this way, it will set a dangerous precedent. We are therefore appealing the decision to the Magistrates Court in early March. This is a costly exercise, and we are looking for support beyond our existing membership. NIMBY Pop Festival on the Heath? The mysterious NIMBY Events Ltd are planning a two day pop festival to be held every year in approximately the same place as the Climate Camp (but bigger). The first one is due to take place on September 10th-11th. Lewisham Council have approved the alcohol license (PDF should be here, but has disappeared). Glendale, the contractors who manage the park for Lewisham Council also approve of the deal. The Blackheath Joint Working Party have considered – and rejected the idea twice, but NIMBY continued with the application to the council despite this. The Blackheath Society are now planning to fight this in the courts, and seem very opposed to it – as can be seen on the front page of their website. There is another meeting of the Blackheath Joint Working Party on Thursday 3rd February, 7.30pm, in St Michael’s Church Hall, Blackheath Park, 1 Pond Road, SE3 9JL, where the plans will be discussed further. Blackheath residents: no more evil propaganda in my door trying to make me vote against an amazing music festival on the Heath. You sillies. The Climate Camp was unquestionably a successful event held on the heath. These would be paying punters, who wouldn’t tidy up after themselves, but the organisers would have to deal with this. The heath is a big place, and many smaller parks hold similar festivals occasionally without the sky falling on their heads. Opposing it outright seems to summon up images of a rather stuffy form of Nimbyism (unfortunate choice of name by the promoters)… Maybe the solution would be to grant a single license for one year, on the understanding that any additional year would also have to be approved. Or I suppose the mysterious NIMBY events group could just do what the protesters did, and turn up without permission, assuming they wanted a free rave on the heath, not a profitable enterprise. I’m sure either outcome would be great for local businesses, and is arguably similar to what used to happen on the heath regularly a few centuries ago. UPDATE: Come to think of it, part of the heath was closed for a day recently to allow a golf tournament. Photos showing before and after the Climate Camp, by Indymedia. If anyone knows anything more about the mysterious Nimby Events, please let me know.